If you are looking to shop outside of the packed malls and box stores this Black Friday, and want to do some handmade holiday shopping instead, check out Flint Handmade’s Handmade Harvest craft show! Ten local Flint Handmade vendors will be selling their unique handmade goods, including jewelry, children’s toys, paper crafts, purses/totes and much more! Held at downtown’s Lunch Studio, the event is free and will have free goodie bags for the first 25 shoppers. 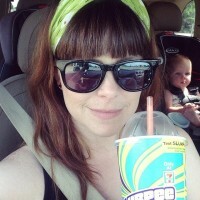 There will also be free family crafts to make and free cider and donuts for all shoppers. 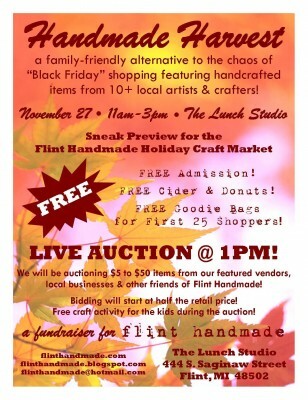 Handmade Harvest will be from 11am-3pm at the Lunch Studio (444 South Saginaw in downtown Flint). For more information, visit www.flinthandmade.com or email us at flinthandmade@hotmail.com.